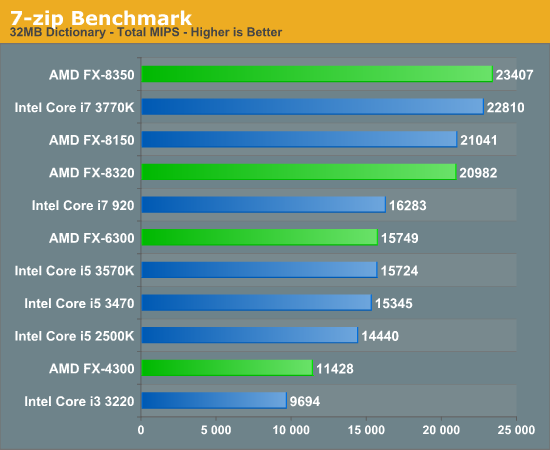 7-zip is almost the perfect scenario for AMD's Vishera: a heavily threaded integer benchmark. 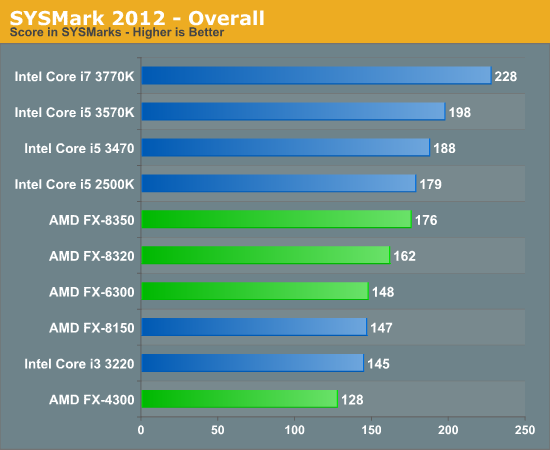 Here the FX-8350 is able to outperform the Core i7 3770K. 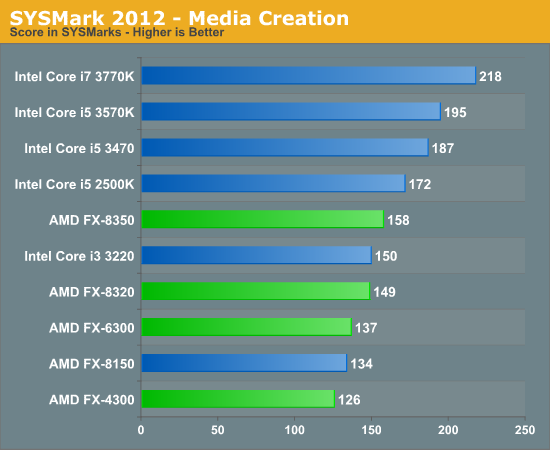 In fact, all of the Vishera parts are able to outperform their price competitive Ivy Bridge alternatives. 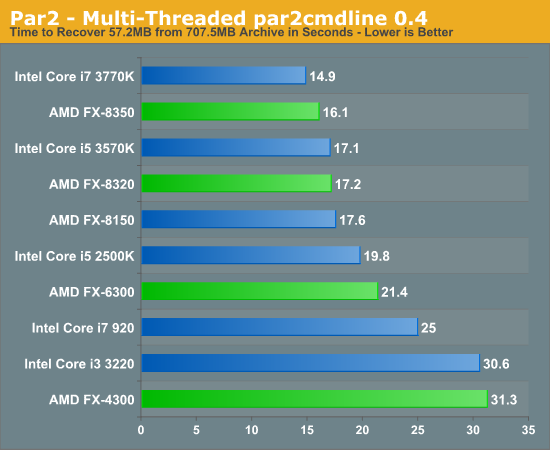 The old Core i7 920 does pretty well here thanks to its 8-thread architecture. 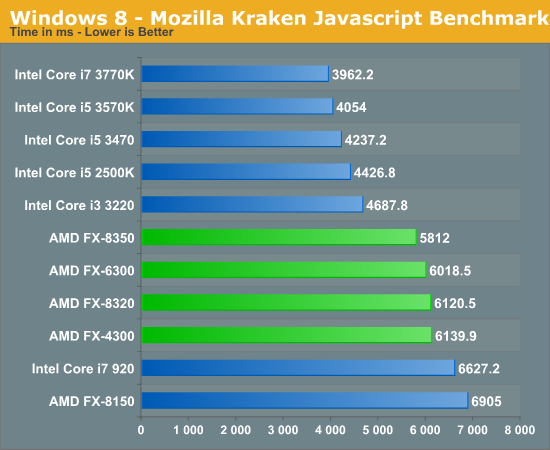 If the 7-zip benchmark is the best case scenario for AMD, Mozilla's Kraken test is among the worst. 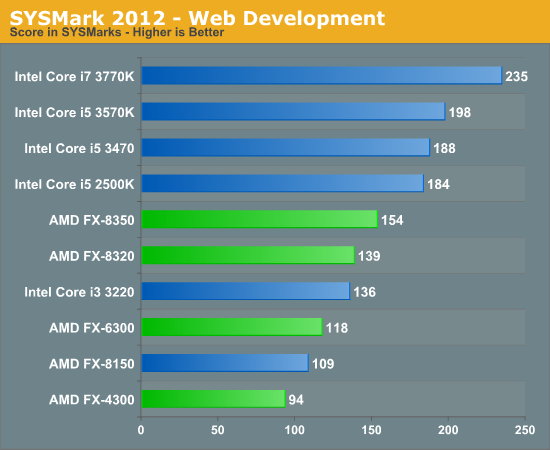 Largely dominated by single threaded performance, the FX-8350 is significantly slower than a Core i3 3220. 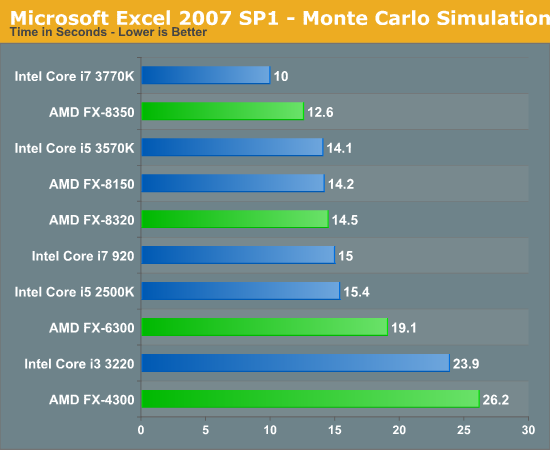 Only Intel's old Core i7 920 is slower here, and that's a chip that debuted in 2008. 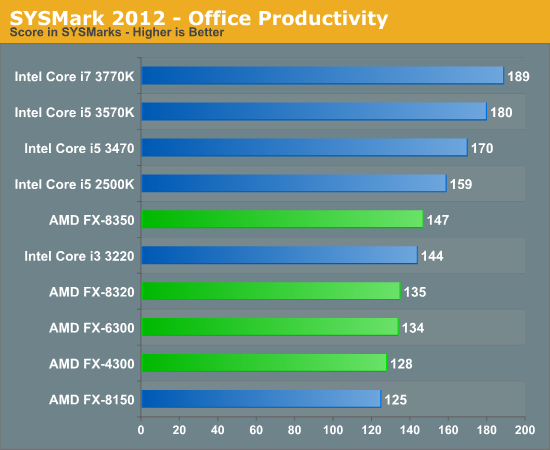 Overall performance according to SYSMark 2012 is within striking distance of Ivy Bridge, at least for the FX-8350. 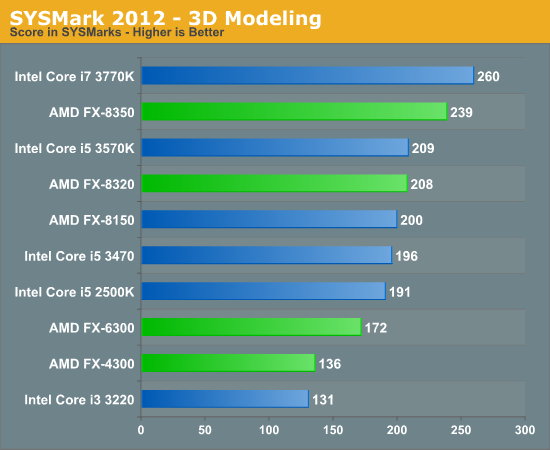 AMD seems to have equalled the performance of last year's 2500K, and is able to deliver almost 90% of the performance of the 3750K. 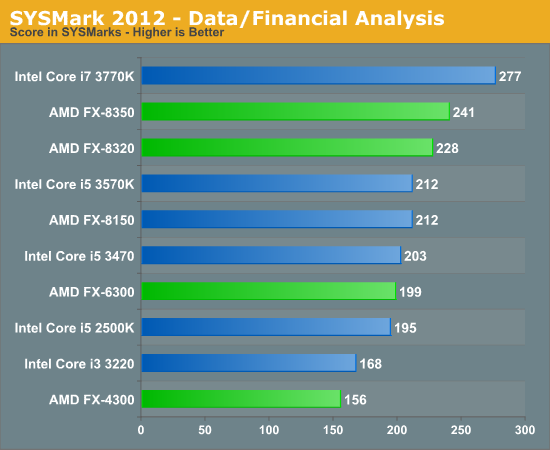 It's not a win by any means, but AMD is inching closer. Chuchusoft took the source code of par2cmdline 0.4 and parallelized it using Intel’s Threading Building Blocks 2.1. The result is a version of par2cmdline that can spawn multiple threads to repair par2 archives. For this test we took a 708MB archive, corrupted nearly 60MB of it, and used the multithreaded par2cmdline to recover it. The scores reported are the repair and recover time in seconds. Crank up the threads and once again you see Vishera do quite well. 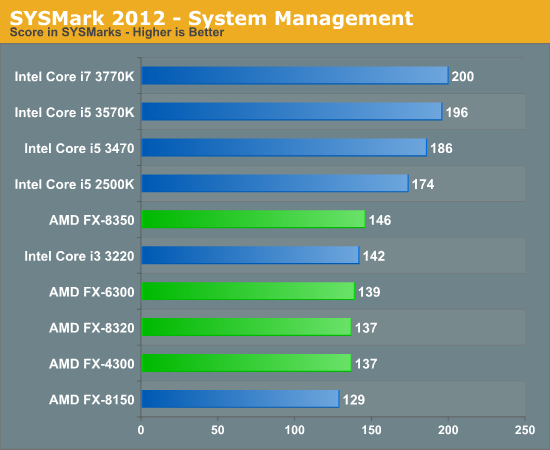 The FX-8350 outpaces the Core i5 3570, and the FX-4300 falls only slightly behind the Core i3 3220.